* A 2 payment option is available for Option #2, payable by credit card only. $300 due with application and balance due in 60 days. Please carefully read all information and complete all applicable sections. If you have any questions or need additional information, please contact the RRHBA office at 540.389.7135 or alowman@rrhba.com. We look forward to having you as a member! Builder Member: Single-family homes, multi-family homes, building, remodeling, commercial building, general contracting, land development, and manufacturing of modular/panelized/log homes. Associate Member: Represents any other aspect of the industry. Examples include architecture, legal services, mortgage banking, marketing/advertising, retail dealers/distributors, subcontractors and specialty trade contractors, and wholesale dealers/distributors. By becoming a member of RRHBA, you join other industry professionals who are committed to fighting for safe and affordable housing in our community. You show dedication to expanding your business and technical skills, and are focused on educating yourself and your customers about the newest industry products, techniques, and services. Anyone associated with the home building industry! RRHBA members are comprised of builders, developers, remodelers, Realtors®, suppliers, subcontractors, financial institutions, distributors, and many others related to the residential construction industry. 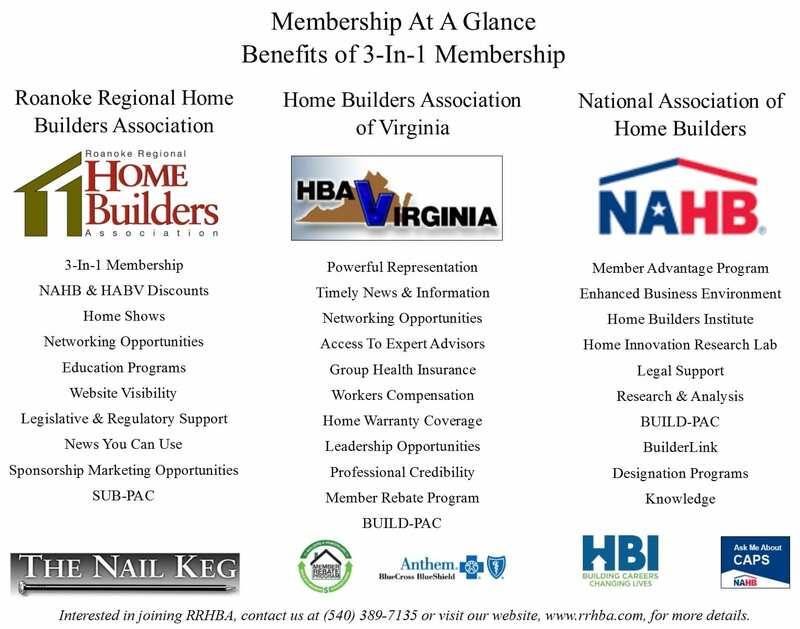 3-In-1 Membership: Includes membership at local, state (HBAV) and national (NAHB) levels. NAHB & HBAV Discounts: Members are instantly eligible for local and national discounts. Home Show: Each year, RRHBA manages an industry related trade show at the Salem Civic Center where exhibitors are able to share their products and services with the general public. Members get a discount on entry fees and first choice on booth space. NAHB also annually hosts The International Builder’s Show, which is the largest light construction show in the world, drawing 50,000 visitors from more than 100 countries. Networking Opportunities: Throughout the year RRHBA hosts numerous events including Business Links Networking, Annual Golf Classic, Membership Meetings, Bowling Bash, and much more. You will have the opportunities to meet, learn from, and market your business to the most successful and powerful players in the home building industry in our region. Take advantage of the opportunity to develop lasting business relationships and participate in the continued success of the Association. Educational Programs: Enjoy opportunities throughout the year to grow yourself professionally through the multitude of educational programs offered including Certified Aging in Place Specialist (CAPS) certification, CPR and First Aid Courses, Technology Updates, Lead Renovation, Repair and Painting (LRRP) Refreshers, and more! Website Visibility: All RRHBA members are listed on our website which allows consumers to easily search for all their home-related needs. We also feature members in our newsletter, on social media, and through sponsorship of events. Monitor & Address Legislative & Regulatory Issues: Government regulation can have a tremendous impact on your business. RRHBA and its affiliates promote legislation favorable to affordable housing on the local, state, and national levels. For example, in the past 15 years, HBAV lobbyists and advocates have pushed for and successfully seen 55 bills pass that benefit builders while defeating 72 bills that would have negatively impacted the industry. News You Can Use: We strive to keep you up-to-date on all issues affecting the industry whether on the state, local, or national levels through our enewsletter, The Nail Keg. Health Insurance & Employee Benefits: The HBAV Benefits Group is an independent insurance brokerage which has partnered with Premier Insurance Agency and many of the strongest insurance carriers to provide benefit programs to your company that are second to none. Working with groups large and small, we specialize in Employee Benefits Consulting, Workers Compensation and General Liability coverage for contractors and other businesses. Click here for more information. Workers Compensation & General Liability: Special workers compensation and general liability programs are offered through our endorsed partner, The Building Industry Insurance Association, Inc. Our agency partners can help your company to save money on your insurance protection. Click here for more information. Member Rebate Program: Builders and Remodelers receive rebates for reporting the products and materials that they use in their projects. Members are able to submit claims for completed homes, remodeling projects, or multi-family units and receive rebates. Click here for more details. Verizon Wireless Discount: Eligible contractor-members are able to take advantage of discounts up to 22% off their wireless phone service. Contact Monique Smith at (804) 357-9600 or monique.smith@verizonwireless.com. Powerful Representation & Information: The primary purpose of the association is representing the home building industry in front of Virginia’s legislators, regulators, and lawmakers. HBAV is consistently ranked as one of the most effective professional organizations in Virginia. Our lobbying team is working year-round to promote and protect the housing climate in the Commonwealth. Networking & Professional Leadership Opportunities: Cited as one of the most valuable benefits by builders and associates alike, HBAV has numerous committees, foundations, and councils that offer members the opportunity to get involved and network with their peers within the housing industry. Timely News & Information: During the General Assembly Session, HBAV reports to our members weekly, through HBAV’s “Legislative Bulletin.” The “Virginia eVoice” provides bi-weekly updates on important issues to the building industry in Virginia, and the “HBAV Annual Report” provides a year-in-review – highlighting accomplishments, achievements, and our important leadership in the Commonwealth. Member Advantage Program: Your membership entitles you to discounts on vehicles, shipping, cell phone plans, computers, car rentals, office supplies and more. NAHB’s purchasing power means big savings! Click here for a complete list of discounts. Enhanced Business Environment: Protecting housing and helping builders surmount obstacles to success leading the charge to protect its members interests by urging lawmakers to reduce burdensome regulations, adapting sensible workforce development, and enacting housing finance system reforms. Home Builders Institute: NAHB’s educational arm, HBI, is a national leader for career training in the building industry. It provides students the skills and experience they need for successful careers through pre-apprenticeship training, job placement services, mentoring, certification programs, textbooks and curricula. Click here to learn more about HBI. Home Innovation Research Lab: Home Innovation Research Labs helps its clients in the residential construction industry overcome barriers to innovation so that they can improve the quality, durability, affordability, and environmental performance of homes and home building products. Click here to learn more. Legal Support: NAHB provides numerous legal resources for members and for state and local association staff. While the NAHB staff counsel cannot replace your local attorney, we may be able to help with legal research, litigation funding, and/or litigation strategy, depending on the situation and the issues involved. Research & Analysis: NAHB serves members and local home builders associations with legal ordinance reviews, land development ordinance reviews and economic impact analysis. These services can provide critical information in support of proposed development and building projects. BUILD-PAC: BUILD-PAC’s mission is to elect pro-housing candidates to Congress in order to defend housing and the home building industry, guard against harmful regulations and protect your business. A contribution to BUILD-PAC is not just an investment in your industry, it is an investment in your personal business. Click here for more information. BuilderLink: When we reach out to members of Congress, we have an impact on the decisions they make. BuilderLink, NAHB’s national grassroots program, advances the housing industry by connecting members of Congress to the people who matter most – their constituents. Click here for more details. Designation Programs: NAHB offers a total of 13 professional designations for builders and remodelers, sales and marketing professionals and those involved in affordable housing. At present, there are more than 12,000 active designees, including almost 1,000 who earned designations in 2014. Greater Knowledge: NAHB Education is focused on providing the education resources that members need to stay abreast of the latest trends and best practices in residential construction. Mission Statement: “To serve, support & represent the building industry” ~ Since 1955, proudly serving the counties of Botetourt, Craig, Floyd, Franklin and Roanoke; and the cities of Roanoke and Salem. Chartered in 1955, the Roanoke Regional Home Builders Association (RRHBA) is a nonprofit trade association, affiliated with the HBA of Virginia (HBAV) and the National Association of Home Builders (NAHB). The Association is governed by a board of directors and executive committee representative of its builder and associate membership. To download Roanoke Regional Home Builders Association by-laws click here. The affairs of the Association are governed by a Board of Directors, which is elected annually by the RRHBA General Membership. Peter Fields, Fields Construction, Inc.
Frank Caldwell IV, Jack St. Clair, Inc.
Brett Bennett, Roanoke Gas Co.
Andy Kelderhouse, Fralin & Waldrin, Inc.